We realized this dream, not long ago in Iceland. The four of us decided to set out in this wonderful country of diverse landscape & natural beauty, to live out a truly unique experience in the land of fire and ice.. We wanted it to be epic and authentic, to experience the freedom of the open road and the adventure of not knowing exactly where we would spend our nights. Simply for that reason, we had to do it like we had always wanted to: in a camper van. For this, we went to CampEasy where we experienced a great atmosphere & customer service, free coffee – and above all – the perfect camper van to fit the four of us. It had everything: beds for 4, table, seats, kitchen, fridge, plates, cutlery, cups, heating, blankets, pillows… It couldn’t have been better! Once we picked up the camper, the adventure could really begin. Before we picked up the campervan, we bought some supplies for the trip; most important was the food that we would need for the 3 days to come. When it came time to calculate everything, we took account of the meals we would need, like breakfast, lunch, and dinner. The truth is that when dividing costs between 4, the overall cost of food is lowered considerably. Between all our purchases, we included cereal, fruit, and foodstuffs in reserve that can be consumed hot or cold. Another necessity is an ample supply of bottled water, which can easily be refilled in service stations scattered throughout the island. We didn’t worry much about our supply of food, as there are always mini-markets attached to the service stations, which include a limited – yet comprehensive – supply of food that doesn’t vary much in price with respect to the normal supermarkets. If we had to choose one thing we liked most about the camper, it would be the comfort and flexibility it provided our trip. It lets you make stops where and when you want to enjoy the views, take a break from driving, or simply eat a meal like at home, regardless of where you are. In reality, we didn’t have places or stops planned ahead of time, we simply set off and decided everything on the way. One could call it something of an improvised trip, with everything but our return date subject to change. We, being a group of four, distributed ourselves in an equivalent fashion of 2 & 2: The driver and DJ up front, and the lazy people behind. It was the perfect formula for good vibes, lots of music, and plenty of laughs for the duration of the trip. 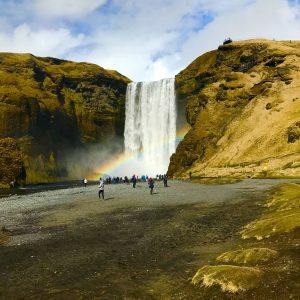 Our first stops were the impressive waterfalls of Seljalandsfoss & Skógafoss. Two must-see stops on the south coast of Iceland & the ring road trip, and on top of that, easily accessible if you drive the route yourself. Here we took advantage of the break, had a bite to eat, and relaxed to some spectacular views before the next segment of our journey. One of our favorite places of all was the Solheimajokull glacier. An impressive scene that combined moon-like terrain, mountains covered with mossy rocks and a frozen waterfall spotted with gravel. In addition to all that, we had to content with the ever-changing Icelandic climate, which continually surprised us with sun, rain, wind, and later, hail. After a good exploration of the area, we saw the necessity of going back to the heat of the camper van, so we took some last photos of our surroundings and shortly after continued on to our next stop. Our next adventure took place in the most coastal zone in Southern Iceland. First, we parked the camper in a secure location, then we climbed a small mountain close to Dyrhólaey, which housed a cave with a very impressive view of the surrounding area. Later, we continued until the black sand beaches & the impressive basalt rock formations of Reynisfjara. Having been accustomed to the white sand of beaches in our native Spain, the distinct landscape here left us astonished: black sand, basalt formations, and a powerful ocean all around – with its waves breaking forcefully on the coastal rocks. It’s almost as if the waters themselves are advising you that it’s might not be the best idea to swim in them. And how is the availability of gas stations on the island? The guys at CampEasy give you the camper van at the beginning of your rental with the tank already full. This was plenty for us, and we were actually able to go without filling up until we had almost reached our destination at the east of the island. The vehicle, despite being quite large, consumed relatively little gasoline. However, throughout Route 1 (The Ring Road), you’ll encounter several gas stations. Despite that, the distances between one gas station and another tend to be irregular, and because of this, it’s better to fill up when you see one rather than risk running out of gas on the road. Of course, the number of times you’ll have to stop will depend on how you drive your vehicle, and how good its fuel economy is. The price of gas in Iceland isn’t cheap, but we had the benefit of a special discount in select N1 gas stations – provided to us thanks to CampEasy. Even so, the price of gas was not a problem for us, as we divided the cost between the four of us. We spent our first night in Vík, a town found in the southern part of Iceland, and noteworthy for its campsites at the foot of picturesque mountains. 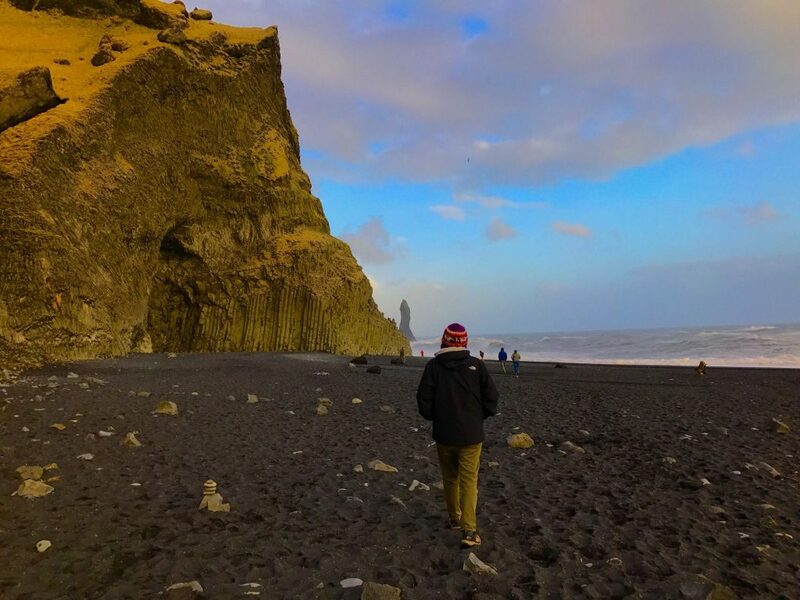 It’s one stop that all people visiting Iceland simply should see, both for its landscape combining black sand beaches and breathtaking mountains. On top of that, this place sports a rest area including a restaurant, market, and full-service gas station. There, we ate a delicious Icelandic hot dog and various other local specialties. The night in the camper van was, overall, really quite comfortable, as the camper’s heating system easily held back the primeval cold of the Icelandic night. We also used our sleeping bags in conjunction with the heater, in addition to the pillows and blankets that come with the camper. 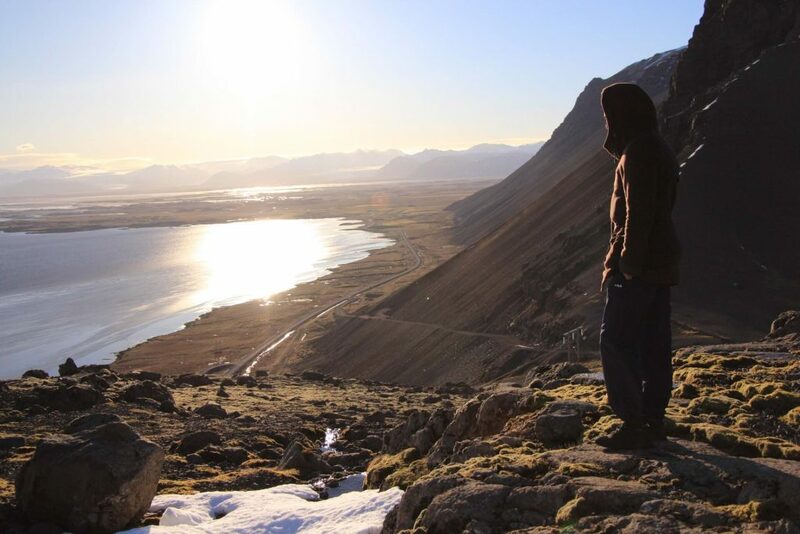 The next day, we got up early, ate breakfast, and started off again towards East Iceland. The landscape from Vík until Höfn was incredible. Throughout the journey, you find yourself surrounded by scenery that makes you wonder if you’re still on planet Earth. First, we started to make out blackened, desolate terrain of moss-covered rocks – something completely unique and at the same time characteristic of Iceland. 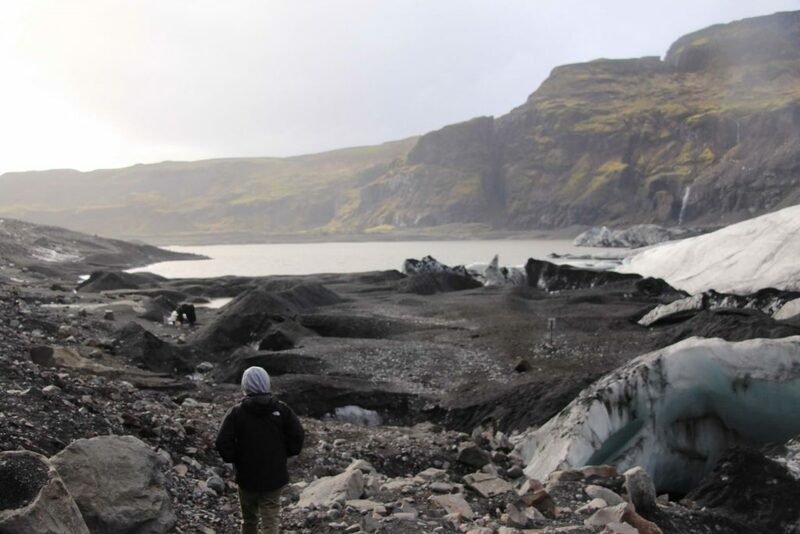 Later, our surroundings gave us the sensation of being on the moon, which is also representative of the area situation alongside the Vatnjökull glacier – known locally as Skeiðarársandur. As we went on, we decided to climb the glacier: A mountain area with views of a maroon-tinted lake containing sediment-blackened snow. Impressive. 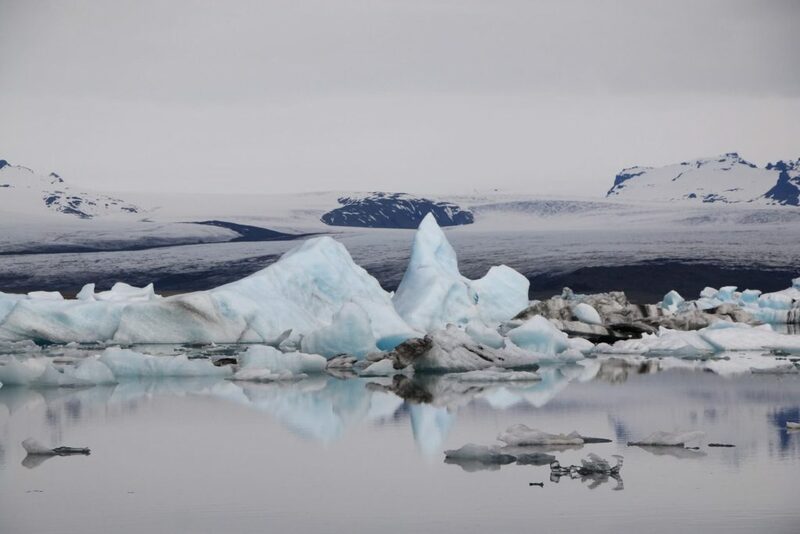 A similar view, but one more earthly and illuminated, could be seen in the Jokulsarlon Glacier Lagoon where, in addition, we spotted a couple of seals making their way towards the ocean. 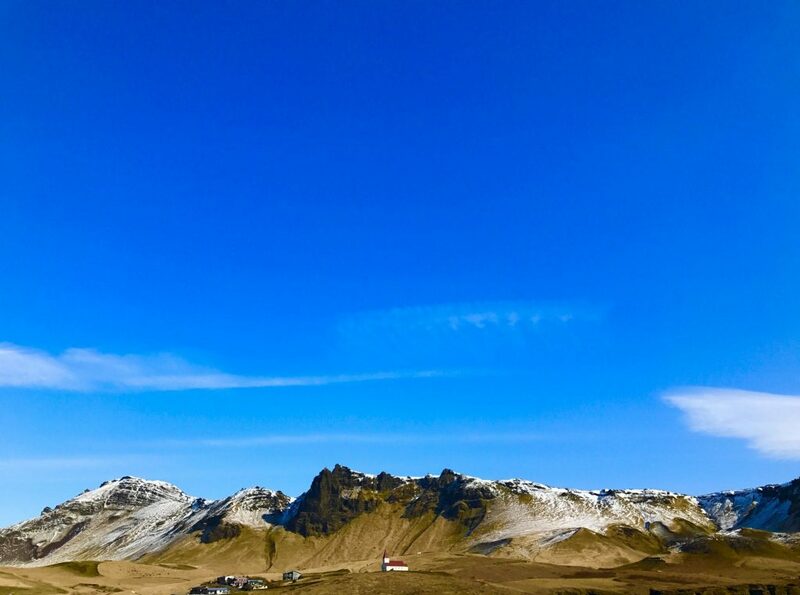 Our last destination was Höfn, a town situated in the east of Iceland where we spent our last night of the trip. Before we arrived, we wanted to do a bit of hiking in one of the surrounding mountain ranges. Here, we took in the beautiful mountain landscape, snow, moss, and sea. We dedicated a few hours to the endeavor in order to fully enjoy the tranquility and scenery of this special place. Upon returning from the mountains, we stayed inside the camper to rest a bit, eat, relax, and spend our last night on the road among stories and smiles. The next morning, we started the return trip to Reykjavik that originally took us about 6 hours, and once again we took the opportunity to enjoy the passing landscape. As the saying goes, all good things must come to an end. Even though we would have like to have kept going on our adventure trip in Iceland, we were ultimately restrained by our limited time. Without a doubt, the best way to travel through Iceland is with a camper van. The versatility of the vehicle permits you to move about with friends in a comfortable way, and with a type of freedom and flexibility that many travellers seek. The customer service and professional conduct of the CampEasy team was simply excellent. Upon returning the camper van, they even went as far as to give us a lift to the city center without additional cost. From a customer’s perspective, it was a top-quality experience, and one available to clients of all economic brackets at an easily manageable price. P.S. 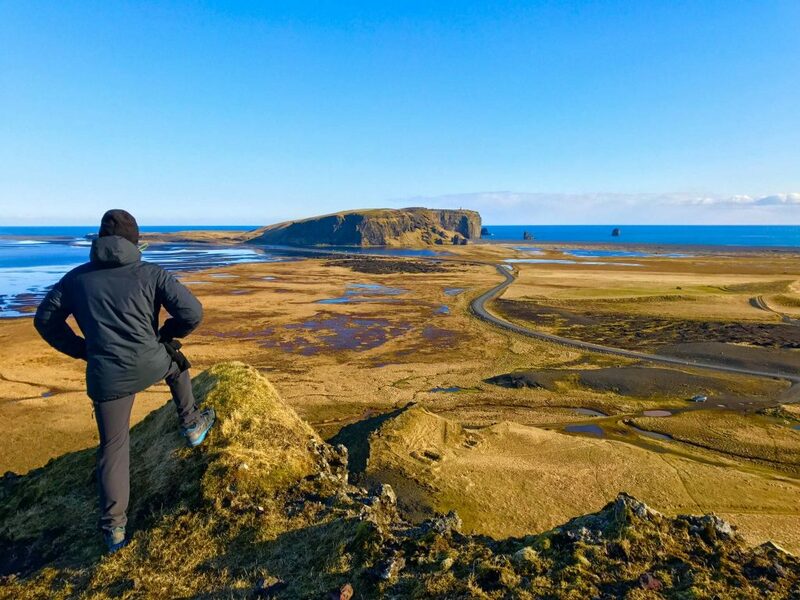 The entire trip through Route one – from Reykjavik to Höfn – is easily done in less than 2 days, even while proceeding at a very relaxed pace, in order to enjoy in detail each stop along the way. It is important to load up with supplies (but not excessively so – not too little nor too much) and to take into account that you can buy supplies on the way in service stations scattered throughout the route. Keep in mind the following essentials: water, non-perishable foods (or those that will last at least several days). You can refill your water bottle practically anywhere. In Iceland, the water is free. Bring a good sleeping bag. Even though the camper has heating, on an especially cold night the temperature inside the camper can get less-than comfortable, especially in winter. On top of that, it will allow you to camp with more comfort and flexibility. Even though there are various free campsites hidden throughout the island, the majority are pay-only, but they will almost certainly sport highly economical prices: normally around 1000 ISK per person. Be attentive to not leave waste nor garbage behind – pack out what you pack in! Re-fill your vehicle when you’ve gone past the halfway point of your tank: the next gas station might be 200km away. Be careful of the wind! The Icelandic winds are famously strong, and because of this, it’s important to be careful while opening your car door in windy conditions. On the other hand, be careful when scaling cliffs or mountains: the risk of falling rises with the force of the wind. Camper vans have been known to blow off the road in some cases. Don’t leave your car on the shoulder of the road! Firstly because normally there isn’t one, or there is one with very little space to spare. Above all, though, it restricts the normal flow of traffic and could damage the road. Leave your car in approved areas only, there are plenty of them! Be careful with the wildlife! Sometimes you’ll encounter birds, cows, sheep, or horses on the way, perhaps crossing the road in front of you. Always be aware in order to not cause harm to them, or provoke accidents.